Ticketing agreement boosts choice and flexibility of flights for passengers. Transaero, Russia’s second-largest airline, has started to sell tickets for flights between Moscow and London with the leading budget airline on the British aviation market, the discount carrier easyJet. 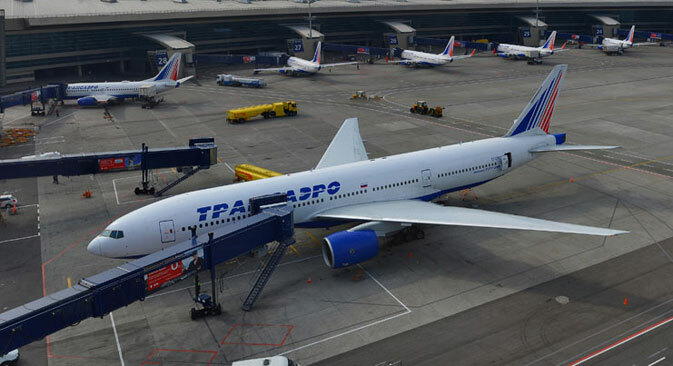 “In addition to our own flights operated from Moscow’s Vnukovo to London’s Heathrow, Transaero offers passengers the opportunity to fly from Moscow’s Domodedovo airport to Gatwick airport,” said Olga Pleshakova, general director of Transaero. Tickets are available for flights beginning December 16, 2013. Discount or budget airlines generally offer minimal services and low-cost, non-refundable tickets starting from €20 one way within Europe. Typically, the price does not include seat selection, checked baggage, or a meal; the passenger pays extra for these. The price depends on how far ahead of travel time the ticket is purchased, with the lowest prices offered for early booking. If people buy tickets a day before the flight, the ticket price is comparable to those on traditional airlines. There are several veteran companies on the market that offer such discount pricing. Besides Britain's easyJet, other European leaders are the Irish Ryanair, the Hungarian Wizz Air, and Germany’s Germanwings. The co-operation between Transaero and easyJet, which flies 600 routes across more than 30 countries, was made possible by an intergovernmental deal, which obliges designated carriers to enter into commercial agreements. Transaero and easyJet are the second designated carriers on the Moscow-London route. “We are confident that this partnership, which is the first of its kind in airline history, will be mutually beneficial,” said Ms Pleshakova. EasyJet began to offer flights between London Gatwick and Moscow in March this year. Now Transaero can sell its tickets as well. The Russian airline confirmed that there were three pricing levels, two of them promotional fares with the cheapest offered for flights only on Tuesdays, Wednesdays and Thursdays. “The availability of fares will be determined by ticket demand,” it emphasised. International discounters are already active on the Russian market: the German airlines Germanwings and AirBerlin have flights to Russia. However, easyJet’s commercial agreement with Transaero marks the first time a Russian airline has entered into a commercial agreement with a discounter, said an airline source. Discount airlines have not yet become established on Russia’s domestic market. Two companies that offered discount pricing – Avianova and Sky Express – declared bankruptcy two years ago. Obstacles faced by Russian discount airlines include airport fees that are up to three times higher than in Europe, according to Mr Kantorovich. But Russia’s current legislation is the main road block to creating budget airlines, said a Transaero source. For example, airlines in Russia are not allowed to sell non-refundable tickets, must provide free meals on board, and must give passengers a certain amount of checked baggage free. Another problem is the existing airport infrastructure, which is not set up for handling low-cost flights.